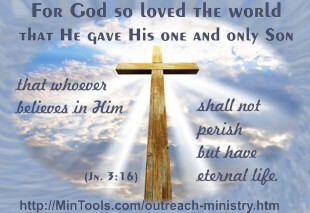 God provided for the salvation of the world through Jesus' death on the cross. God initiates the outreach process by . . .
so people hear and respond as "faith comes by hearing"
God uses believers in the process as . . .
missions, one-on-one witnessing, visitation, door-to-door, church planting, etc. God uses Christians in the outreach process to help . . . The Outreach Ministry Manual includes this content along with some Scripture and questions to help you think through where your church or ministry is putting the spotlight.